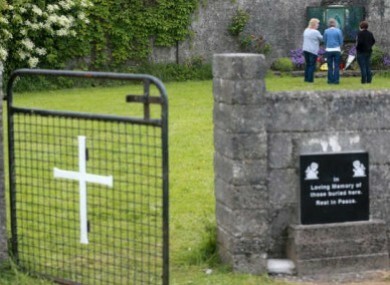 A SECOND BURIAL ground has been found at the Tuam mother and baby home, where 800 children are believed to have died. A report in today’s Irish Daily Mail says that the burial ground is adjacent to the one which made international headlines in the summer. The site was found by local historian Catherine Corless, who told RTÉ’s Morning Ireland that the site was a “continuation” of the first site. She said that she had noticed a proposal from the local council to do something to with the site. The plan had been to build a playground on the site. Corless said that the site does not mean that there are additional bodies, however. Corless says that the minutes show that Galway County Council was aware of the site as far back as 1979. She says that the maps and minutes “absolutely prove” that the children are buried there and are being “walked on and driven on”. She said that she has met with Children’s Minister James Reilly, but said that he did not give her a timescale for the Commission of Inquiry. Email “Second burial ground found at Tuam mother and baby home”. Feedback on “Second burial ground found at Tuam mother and baby home”.